In 1938, Sir John Anderson, Lord Privy Seal, was tasked with keeping vulnerable civilians (pregnant women, children, elderly, and the disabled) safe within the six cities that had been deemed as potential targets of Hitler’s bombing should Britain and Germany go to war. Anderson devised a plan to evacuate these civilians over a four day period when necessary. On September 1, 1939, the day Hitler invaded Poland, Anderson executed the plan. From the government’s standpoint, the evacuation program achieved its goal. 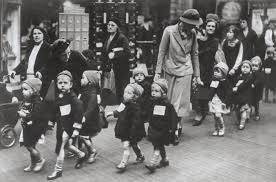 Of the approximately 60,000 English civilians who were killed during WWII, only 5,000 were children. In the opinion of the evacuees and their families-biological and foster-the program was a mixed success. The Imperial War Museum and others have conducted interviews with evacuees, and many memoirs and fictionalized accounts have also been written. The common thread I found during my research was the fear experienced by the children, whose age ranged from two or three years old to sixteen or seventeen. Most didn’t understand why they were being separated from their parents, nor did they know where they were going or for how long. within Britain as well as overseas to Canada, South Africa, Australia, New Zealand, and the United States. Upon arrival, the children stood in churches, community centers, and train stations or on docks gripping their gas masks and suitcases waiting to hear the words, “I’ll take that one.” Once selected by a family, these urban children and their rural hosts dealt with significant cultural and class differences. Fast forward six years later to the end of the war. Scores of children returned home as veritable strangers to their parents and siblings, never fully adjusting to living back in the city with them. Through hard work, others were able to re-establish family relationships. I cannot imagine the mixed emotions felt by the evacuees’ parents: a love strong enough to send their children away to safety mingled with regret at missing out on the development of their children.